Cooper Cronk saved a special sledge for his halves partner, Luke Keary. 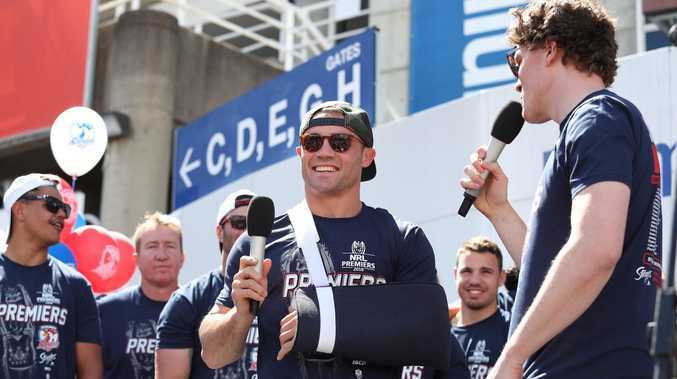 WEARING sunglasses and a sling, Cooper Cronk was walking busted the day after the Roosters won their 14th premiership. But his sense of humour was far from broken. 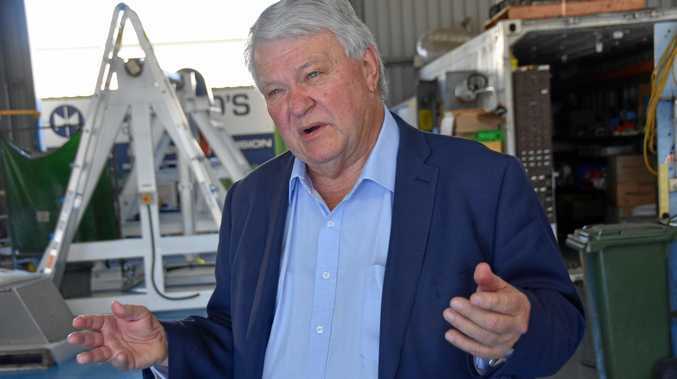 Speaking to a crowd of hundreds of diehard Roosters fans on Monday, the busted halfback talked about playing through the pain of a broken shoulder blade, but how he couldn't have done it without the help of his teammates. Especially Luke Keary, who was awarded the Clive Churchill Medal for his performance. But instead of pumping up his young halves partner, Cronk threw in a cheeky sledge to leave the crowd in stitches. "I've been carrying Luke Keary for the last 10 months, so he carried me through last night, so that's all right," Cronk said, his teammates bursting into laughter behind him. Cronk went on to say that top win a grand final you have to have a lot of support from behind the scenes. "It's obviously a really big game that we were a part of, and from the top down at the football club, the admin staff, playing group, fans and supporters had sacrificed a lot for me to come here so it was my duty to go out and give my absolute best," he said. "Sometimes a performance like that needs the whole club to do their job and I thought it was a very good coaching performance from our coaching group, I thought our physical preparation staff had us peaking at the right time and then the boys, even the guys that didn't make the 17, they really trained hard against us to make us play our best football. "If you go through Round 1 to our last game I think it's fair to say that we built our season and we deserved what we got last night."